The Corgi Cleemput bible has a chapter in the rear: 'What should have been'......but never materialized. 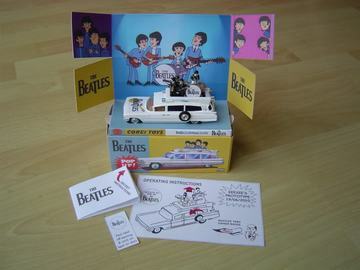 There is a picture of a model which was supposed to be a Beatles car. It was made from a Superior ambulance. My version is in the 1964 style, because the Beatles then visited Blokker, Holland. Figures are resin, guitars made of wood, the complete platform moves up and down by rotating the spare wheel. The diorama box, made by a friend, finishes it off, and of course there is an envelop with secret instructions!